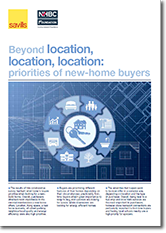 This report, a collaboration between the NHBC Foundation and Savills, explores the priorities of new-home buyers. Based on feedback from over 5,400 survey respondents from across the UK it explores priorities in three density categories and for four different buyer categories (first-time buyers, upsizers, relocators and downsizers). The study included questions on features of the home, specific new-build considerations, parking and the importance they attached to nearby amenities. The research informs future marketing strategy by identifying a group of core buyer priorities and setting out specific priority profiles for the main buyer types. This work highlights an increasingly discriminating and complex market with a diversity of priorities among different buyer types. This report, a collaboration between the NHBC Foundation and Savills, explores the priorities of new-home buyers. Defines the survey scope and provides a profile of the 5,407 households that participated: shows distribution of home type and size, reasons for buying (whether first-time buyers, upsizers, relocators or downsizers – including age distribution). Also describes the three density categories (high-density urban, medium-density urban and suburban) that were used to segment the sample. It then establishes priorities of new-home buyers for the four buyer types and presents specific observations from the density categories. The report concludes with a short summing up section and includes selected further reading.